Julia Gillard, Tony Abbott; here’s a tip- getting social with your constituents might just win you the 2013 election. By taking a closer look at President Obama’s use of social media during his 2012 election campaign, political strategists will agree that the power of social media in politics is undeniable. Particularly when viewed by the numbers where the Australian Bureau of Statistics record Internet subscription in Australia as having passed the 12 million mark; out of a total population of some 22,867,338 people at the time of writing this post. Socialbakers place usage of Facebook in Australia at some 11,890,760 people with accounts. That’s only 100,000 or so shy of the number of Australians with internet subscriptions: or roughly half the population. As of April 2012, SMK place some 1.8 million Australian’s on Twitter; or about 1/12th of the Australian population. So Facebook + Twitter = a social reach of about half the Australian population. Don’t automatically discount those under the age of 18 from these statistics: through conversations with their parents and peers they will influence the social political debate. You might not have their legal vote, but you will have cultivated potentially life long allegiances. What newspaper, current affairs program, online media outlet or magazine can give you that reach without a scandal? President Barack Obama won in more than one way yesterday. The Democratic incumbent not only locked down a second term at the ballot box, but also finished his campaign as the undisputed victor of the social media battle with his opponent, Governor Mitt Romney. With a 2013 election looming in Australia, and a new wave of voters heading to the ballot box for the first time, arguably all of whom are digital natives: how will Australian Politics (or #AusPol as it’s referred to on Twitter) reach their social audiences during their campaign and turn that social investment into votes? The Australian Political landscape is significantly different to that of the United States, where politicians garner celebrity status. Our politicians don’t have the same brand power. They can’t pull stadium crowds or the same donor revenues. This is where strategic use of social media can make a difference in their campaigning. Per capita , Australian Politicians have less to spend to get your vote. How do they reach you? How do they engage you? How do they convert that connection to a vote? The answer is in starting local. Kevin Rudd was the first politician in Australia to exploit social media: both in his electorate, at a State level and Nationally. His appeal is intuitive, he shares openly and he responds with authenticity. These attributes are what translates social pull into social power in Australia. Like Kevin Rudd, President Obama brought a personal style of connection to social media: just like you’d share your music videos, family snaps and jokes on Facebook, Obama was able to connect with his social following by being one with them, rather than one apart from them. This has the added advantage of appealing to a broader range of people. You might not like his politics, but you might have musical taste in common for example. People innately gravitate toward others that share their passions, likes and dislikes. 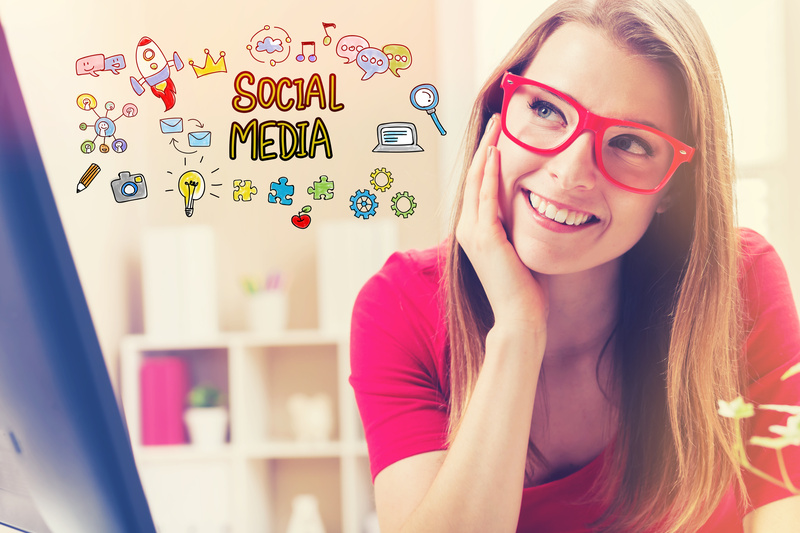 Social is the perfect tool to both get to know your audience and for them to get to know you: particularly when the margin between winning an election and losing an election is so close a slight breeze could make the difference. This is how to win your fence sitters, or those who usually vote for the other side but have become disenchanted or frustrated with a lack of leadership and party politicking. This is how you steal voters away from their traditional allegiances: by demonstrating organically and authentically you have what Australia needs. Arguably, the biggest social success of President Obama’s campaign wasn’t his campaign! 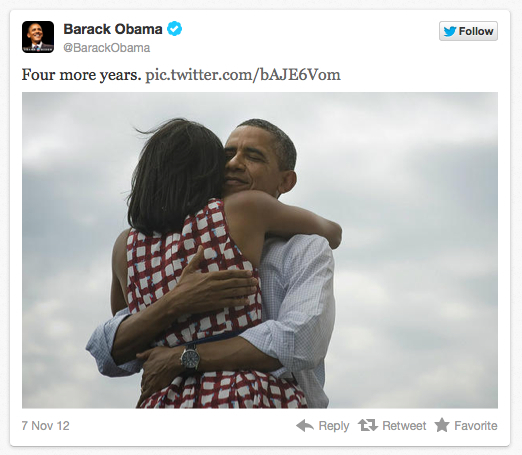 A single tweet, sent as the Obama win was confirmed instantly went viral and became the most re-tweeted picture in history. The fact that social media was chosen to break the story, rather than television or online news media, is ground breaking. The simplicity of the strategy, the poignancy of the image chosen, the three word tagline. A true moment in social history that changed political campaigning forever. The power of pictures, especially candid pictures, cannot be underestimated. Video is also a very powerful tool. Info-graphics are another powerfully engaging and educational tool. Keep your words to a minimum and let your actions define you. Forget perfectly staged publicity shots: share content that is shared with you. Re-tweet, re-post and re-pin content that your audience have taken of you on the campaign trail with them in their communities. Create a social buzz about what might pop up on your next door stop! The biggest mistake leaders (and those in the C-Suite) make in dealing with social media is that, like the news media, they assume it’s a monologue. It’s not. Your social audience simply won’t tolerate being preached to. One click, and they’re gone. Social is a dialogue. If you post or tweet, you need to respond, answer the tough questions and don’t shy away from robust debate. This is an opportunity to feed the news media, not be reactive to its needs and demands (which after all is about selling news, not putting you in office). Sharing news footage, online links and photographs has never been easier. If you liked an article share and thank the publication. A little social acknowledgement and thanks builds a picture of the real person behind the political party: let your constituents get to know you. Did you receive a quirky t-shirt in support of your campaign? Pop it on and take some photographs to share some social thanks. Did a supporter send you in a beautiful letter of encouragement? Ask for their permission to publish a copy on your social feeds. Share the stories of those who support and connect with you. They are an integral part of your story. By embracing social media and adopting the social strategies perfected in President Obama’s 2012 campaign, the next Prime Minister of Australia could also be it’s first social winner: A leader who is more connected to the people of Australia than any leader before them and whose enduring popularity is based on an organic expose of their personal and political offering. No scripts. No spin. No hiding behind advocates and adversaries. Who do you think will be the social winner of the 2013 Australian Federal Election? over 1,260 Facebook Fans on his Page, and over 5,200 Friends on his Account. You can follow my #AusPol Twitter List here.